Capital of Rajasthan, the Jaipur we know today dates back to the early 17th century. 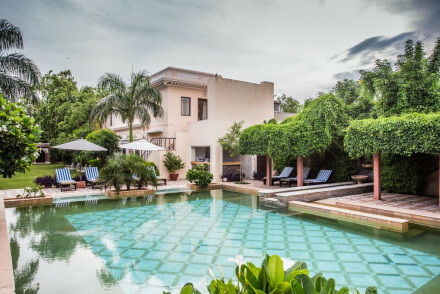 There is a wide choice amongst our picks of the best places to stay in Jaipur - from the regally opulent Raj Palace, no-frills modern hotels aimed at business travellers to smaller, more authentic properties. The very name Jaipur is synonymous with glamorous tales of Maharajas and their palaces. 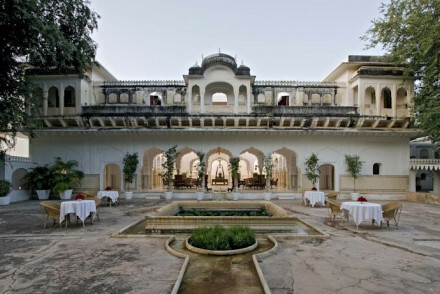 One such example is Rambagh Palace, which went from a hunting lodge to a royal residence and today is a 5* hotel. The old city, in the northeast quarter, became The Pink City in 1897 when the Maharaja Jai Singh decided to paint it a welcoming pink for a visit by the then Prince of Wales. Still largely walled, there are four main gates and the bird’s eye view is of a neat grid laid out with wide streets and rectangular plots. Closer to the ground Jaipur isn’t quite so tidy. The roads are frantic, noisy and congested with cars, rickshaws, lorries, buses, bikes and animals. It has a population of nearly 4 million and there are 15,000 licensed auto-rickshaws. But the city still has great charm. It is a popular destination for tourists in the winter months and a great place to shop. You'll love the Elefantastic experience where you not only head off trekking on an elephant but also feed, wash, massage and truly get to know them! A lovely day out that'll leave you in awe of these wonderful creatures. You can also take an elephant ride up the hill to the Amber Fort, a wonderful 16th century building with magnificent architecture and gorgeous views of the city. Visit the Sheesh Mahal Hall of Mirrors, with its beautifully tendered gardens and ornate interiors. This lovely spot is also often featured in Bollywood movies so you may in fact recognise it! 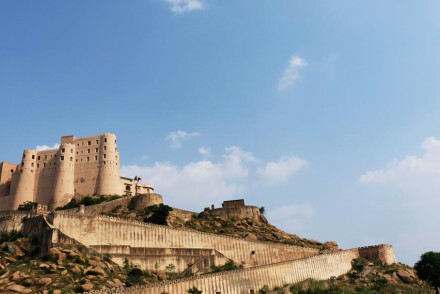 Wander around the impressive Nahargarh Fort and spend some time in its wax museum, featuring waxwork models of a (mostly Indian) variety of celebrities. Of course shopping for textiles is a must! Taxis can be booked from hotels. For short rides, hail an auto-rickshaw. Ask the price and expect to haggle though they aren’t expensive. If the driver speaks no English, find one who does. The modern airport is close to the centre of town (to the south) and Jaipur is well connected by rail and bus services. Be sure to book ahead early to guarantee a room in one of the best places to stay in Jaipur. This city is extremely busy during the winter months, especially during the Literature Festival which is held every January. Havelis (the old townhouses of the nobility centred around courtyards) are often earmarked as the best places to stay in Jaipur because they are usually spacious and set in pretty gardens while still being close to the centre of town. Samode Haveli boasts romantically decorated bedrooms as well as a courtyard with a swimming pool and a sun deck. 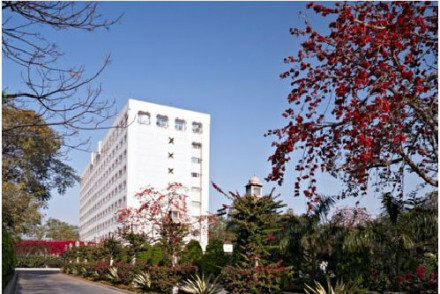 Hotel Diggi Palace offers simple, elegant rooms and in January is a hub for much of the annual Jaipur Literary Festival. 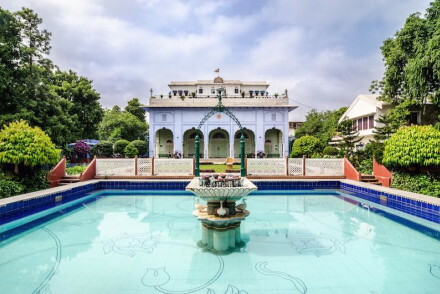 Narain Niwas Palace, set amidst acres of beautifully tendered gardens, boasts traditional Rajhastani accommodation as well as an outdoor pool and a spa. Tuck into gourmet Thali or European cuisine. Royal Heritage Haveli, set in an 18th century property 10km outside Jaipur, boasts lovely suites with warm hues and lavish silks. Enjoy a dip in the pool or relax with a book in the gardens. Very peaceful. 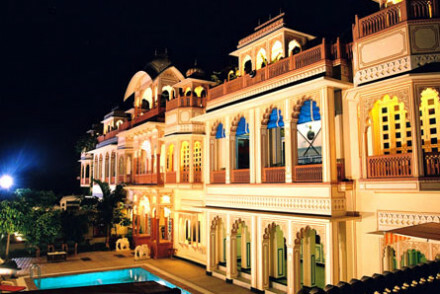 The Raj Palace was formerly the Maharajah's palace and is now a fabulous luxury hotel. It has been exquisitely restored with immense attention to detail using the finest materials. Rooms and suites are bedecked with original furniture. The excellent restaurant houses a unique collection of china and the Swarkovski chandelier is the largest in India. 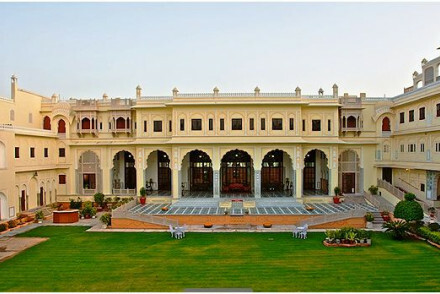 Another former royal abode is the Rambagh Palace now a member of the Taj group of hotels. This was once home to Maharani Gayatri Devi, who was, amongst other things, a politician and style icon. You really feel like royalty here - garlands on arrival are standard. Beautifully decorated bedrooms are traditional in feel. For extra pampering, there is an excellent spa. 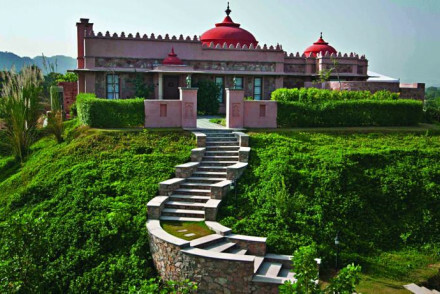 The rose-tinted Sujan Rajmahal Palace offers eight traditional rooms with chic colour palettes and classy interiors. There is also an outdoor pool. Enjoy al fresco meals out on the pretty terrace. 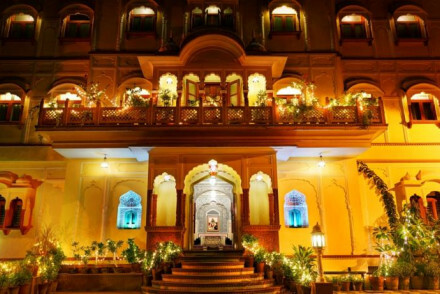 Shahpura House, set in an ornate building, boasts opulent accommodation with rich fabrics and bright colours. Add to that top-notch food, a spa and a pool, you will realise it is a fantastic and romantic retreat. Alsisar Hotel, located in the centre of town, features romantic rooms with antiques, intricately carved beds and traditional Rajhastani motifs dotted around. Come back after sightseeing to relax by the pool or head to the rooftop terrace at sunset. If you fancy something completely different then stay at the Dera Amer Elephant Camp, aka glamping with elephants! Featuring lovely colonial style tents, you can dine out under the stars each night and join in with sunrise yoga sessions. 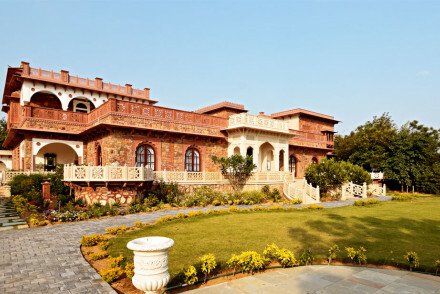 Oberoi Rajvilas is a 5* palace situated just outside the city. Dripping with luxury, the romantic accommodation features plenty of antiques and four poster beds. There are also private pools and splendid cuisine. Dreamy. 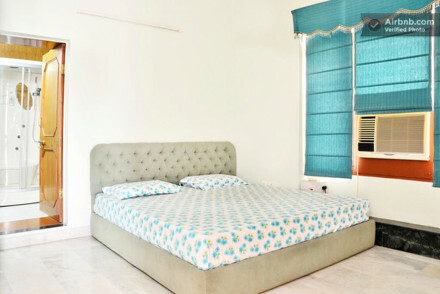 The first five star hotel to be built in Jaipur, Hotel Clarks Amer boasts spacious rooms furnished in a classical style. Enjoy drinks at sunset on the Ta Blu roof top terrace bar after a long day out sightseeing. Lebua Lodge At Amer offers 40 luxury individual villa-come-rooms, with floor to ceiling glass doors and minimalist interiors. Plus, there is a pool, tennis courts, a spa and restaurant - what more could you ask for? 28 Kothi is an intimate boutique property, boasting just five chic rooms decorated with light hues and designed in a traditional manner. Join in with yoga classes and treat yourself to a massage if you like to truly unwind. 47 Jobner Bagh wonderfully blends Italian and Indian decor in a stylish fashion. With just 12 rooms it is an intimate spot, whilst perfectly located to see all that Jaipur has to offer. 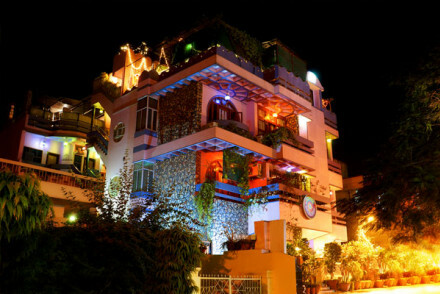 Jaipur Homestay is a charming family home boasting comfortable accommodation and traditional Indian cuisine. With rooms from just £35 a night, it is also perfect for those on a budget. The three room Palm Court Homestay offers lovely traditional accommodation and a wonderful garden in which to relax with a cup of chai and a good book. Centrally located, a great base for local exploring. Pearl Palace is brimming with charm and, what's more, their rooms start from just £10 a night! You'll love the colourful and eclectic interiors as well as the traditional Rajhastani Peacock Restaurant. Their sister property, Pearl Palace Heritage, is a classier property and was featured in The Second Best Exotic Marigold Hotel! The ten individually designed rooms - from £35 per night - are filled with colour. The General's Retreat has everything you need for a budget break, offering comfortable spacious rooms and a large garden in which to unwind after a day out sightseeing. Bhola Bhawan B&B is retro-chic with lovely light and airy rooms from £35 per night. Khas Bagh, located in the Aravalli Hills, is an 18 room farm retreat offering smart classical accommodation with modern bathrooms. Spend your days soaking up the sun by the pool, playing polo or unwinding with some yoga. 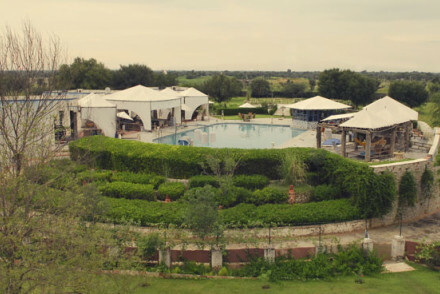 The Farm is a chic oasis situated 40 minutes away from Jaipur. Offering colourful retro rooms with kitsch decorations, you can also join in with cookery, art and yoga classes. The best time to visit Jaipur is from October to March, the winter months, when the weather is pleasant (between 15-27°C) and it's not too hot to get out and about. Monsoon season runs from July to September, and is best avoided. Fly into Jaipur Airport, just 13km from the city centre. Whilst there are no direct flights from the UK, you can fly to Delhi and then take a connecting flight from there. When you've arrived at the airport, hop on a bus or take a taxi towards the centre of town. Browse through our list of the best places to stay in Jaipur and start to plan your stay. Alternatively, widen the net and check out all our recommendations in Rajasthan. Or, feel free to contact a friendly guru for advice. Budget hotel in the heart of Jaipur with bundles of charm and a popular rooftop restaurant. The 23 rooms are packed with character and there is a pleasant lounge and well stocked library. Peacock Restaurant serves delicious Rajasthani dishes and is always thriving. Staff are happy to help. Sights nearby - The Amber Fort is an absolute must visit. Featured in The Second Best Exotic Marigold Hotel. Providing idiosyncratic rooms with decor from around Rajasthan. Each of their ten rooms are individually and intricately decorated - right down to the bathroom tiles. Dine and the popular Peacock restaurant (just 200m away). Excellent value. Great walks - Head out onto the streets of The Pink City with your personal guide. Sights nearby - You cannot visit Jaipur without seeing the Amber Fort. 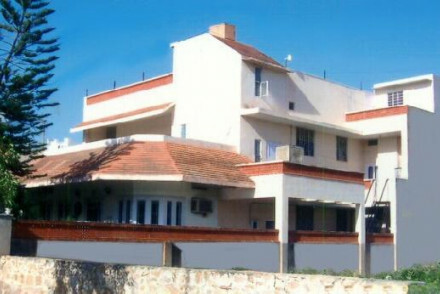 A homely, comfortable guesthouse with a large garden in a smart suburb. Pretty rooms feature tiled floors, white washed walls and attractive fabrics. Lovely sit out terrace, breakfast room and dining room. An affordable gem. Sights nearby - From Jantar Manter to the Amber Fort there is plenty to see in Jaipur. Charming family home run by the ever welcoming Dilip and Tanuja. Feel a part of the family with cosy interiors and traditional Indian home cooking - meals can be enjoyed with the hosts. Rooms are homely and of a good size. There is a living room and sunny garden in which to relax. Sights nearby - The Pink City's sights and attractions are within easy reach. Local markets - Bapu Bazaar is a favourite amongst locals and tourists. Unassuming from the outside this retro-chic property is an absolute steal. Large, light, airy rooms, decorated with pop colours include bathrooms with power showers and complimentary toiletries. An excellent breakfast is included and other meals can be arrange. As can massages in room. A delight. A large, modern family home combining style with traditional interiors. The three bedrooms are immaculate, demonstrating owner Smitri's love of colour and textiles. Food is delicious and home cooked and vegetarian and 'free from' diets are catered for. Enjoy a cup of chai in the sunny garden. Sights nearby - The intricate architecture of the Hawa Mahal should not be missed - the heart of The Pink City. Local markets - Bapu Bazaar is a favourite for sarees and jewellery, sweets and perfumes. Cooking classes - Kitchen Craft offers lessons in traditional North Indian cuisine. A big hotel with a warm heart and unrivalled business facilities. Bright spacious rooms with white washed walls and wooden floors. Excellent gym, reception rooms with jewel-bright furnishing, and spectacular Ta Blu roof top terrace bar. City Style - A sleek, modern hotel with a popular bar. Sights nearby - Amber Fort and the Jantar Mantar: to name but a couple. Local markets - Johari Bazaar is known for its jewellery. 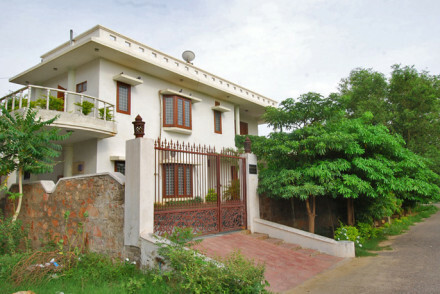 A little off Jaipur's main thoroughfare Shahpura House enjoys a peaceful spot, within easy reach of town. Everything here is rich and vibrant from the fabrics to the food. Rooms are individually decorated in bright colour palettes and astoral chandeliers. There is a spa and pool. Sheer opulence. Local markets - Jaipur is teeming with markets but Bapu Bazaar and Jaipur Textile Market are two of the best. Cooking classes - Cooking classes with the head chef are available on request. Sights nearby - The Amber Fort: a must see. 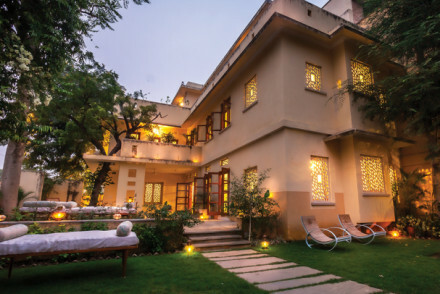 This farm retreat tucked away amidst the Aravalli Hills provides a regal homestay. Eighteen large rooms include capacious beds, ornate fabrics and modern bathrooms. There is an inviting pool and plenty of activities from yoga to polo. Feel right at home in rural Rajasthan. Sights nearby - Amer & Jaigarh Forts are a must visit. 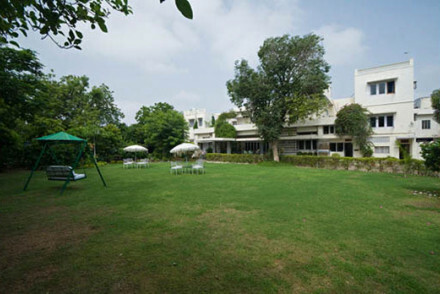 Delightful haveli hotel in large beautiful grounds. Simple, traditional and elegant rooms with cooling verandahs. A haven of tranquility in a quiet part of town. Rooms feature four poster beds and local artworks. Lots of quirky charm. In January it hosts the Jaipur Literary Festival. Sights nearby - The Water Palace, Amber Fort, City Palace are all must sees. A peaceful retreat in the heart of the city. 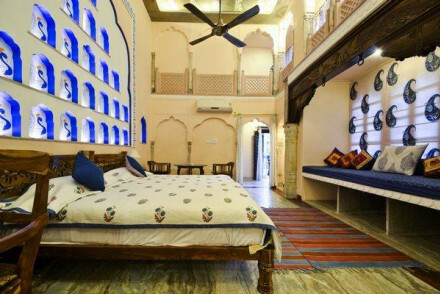 Romantic rooms with antique furniture, intricately carved poster beds, and delicate medieval Rajasthani motifs on fabrics. Lovely swimming pool, shady courtyards and mosaic-work sitting room. Romance of another century. Sights nearby - Amber Fort, Water Palace, City Palace, Monkey Temple, Jantar Mantar: Jaipur keeps you busy. Local markets - Jaipur Textile Market is a treasure trove for fabrics and rugs. 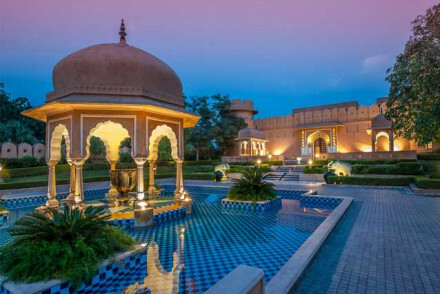 This modern resort, made up of 40 luxury tents, provides a change from Rajasthan's bountiful haveli properties. Offering everything you could wish for there is a pool, tennis, spa, kids playground and much more. Bedrooms feature ceiling to floor glass doors and white, minimalist interiors. Great walks - Up the hill to the Monkey Temple - where over 5000 monkeys are meant to live. Sights nearby - The famous Amber Fort is within walking distance. This 300 year old resort, located just under 50km from Jaipur provides guests with a relaxing hideaway from the frenetic city. Luxurious tented rooms have ornate patterned ceilings and are filled with antiques. Fantastic local cuisine and beautiful gardens to stroll in. A romantic choice. Sights nearby - Amber Fort, City and Water Palace, the Monkey Temple, Jantar Mantar and much more are just a day trip away. Hideaway - Located out the way of frenetic Jaipur but still within a day trip of its sights. A comfortable heritage property in the pink city of Jaipur. Fantastic spa and pool in acres of garden, as well as specialty Thali dining. The fabulous Palladio serves excellent European dishes. One of the less expensive and less grand palaces in Rajasthan, but by no means less fantastical. Foodies - Boasting one of the best restaurants in town: Palladio. Local exploring - Enjoying a fantastically central location in Jaipur. Sights nearby - Jaipur has a bounty of sights: the Amber Fort, Water Palace, City Palace and much more. Local markets - Bapu Bazaar is a favourite amongst locals. Jaipur's newest boutique offering provides stunning accommodation at an even more attractive price. Their attention to detail is key. Design touches such as ornate light installations and colour co-ordinated libraries are a perfectionists dream! Yoga classes and in room massages can be arranged. City Style - A tranquil oasis within easy reach of many of Jaipur's main sights. Local exploring - Perfectly located for exploring Jaipur's sights. Sights nearby - City Palace, Jantar Mantar, Monkey Palace to name but a few are within easy reach. A local gem designers and artisans have been flocking to 47 Jobner Bagh for many moons. Its owners have an eye for style and there is a nod to the 1920s amidst its blend of Italian and Indian decor. More luxurious than your average homestay yet more intimate than a five star hotel. A serene stay. 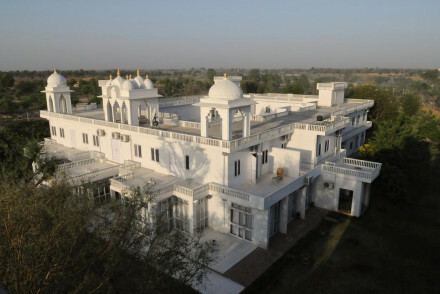 Located but a few hundred metres from Jaipur's old city, Dera Mandawa boasts an enviable location. 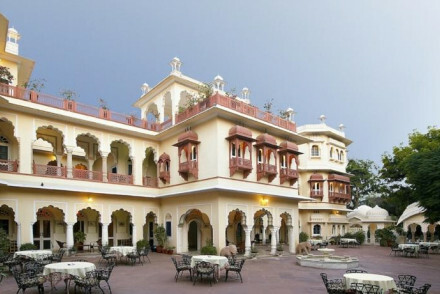 A traditional family-owned 'haveli' featuring eleven uniquely decorated suites. All of the colour and charm of old-world Rajasthan. Guests can try their hand at cooking, kite flying; even saree tying. A quaint spot in the middle of a lively city. A great choice for individuals or couples. Fantastic central courtyard swimming pool and sun deck is perfect for lounging or sipping on a cocktail. Romantically decorated bedrooms, soothing spa facilities and stunning dining room. 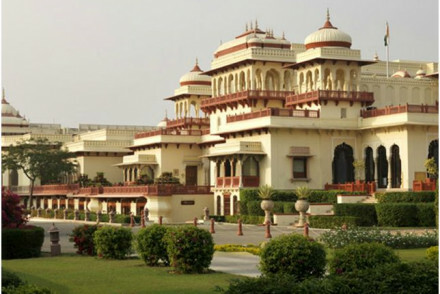 Sights nearby - So much to see in Jaipur: the hotel will gladly organise your tour. Local markets - Jaipur Textile Market is the place for fabrics and rugs. Sailing - Head out on the Ramgarh Lake by boat. An old-soul sanctuary on the outskirts of Jaipur. Fifteen special suites with colourful accents, a serene swimming pool, romantic grounds, and a delicious breakfast. A chic oasis just a short drive, yet a world away from town. This owner managed property reflects their young spirit. Retro rooms are decorated with wonderfully kitsch, Indian curios. There is an organic vegetable garden and room price is full board. Plenty of activities make it great for families. Sights nearby - Jaipur with its many sights is just a forty minute drive. Perfect as you can visit for the day and return to this haven. Hideaway - Located a forty minute drive from Jaipur the farm is an oasis of calm. Cooking classes - Just ask the chef! Chic hotel on the outskirts of Jaipur. Each of its fourteen rooms are uniquely decorated in whimsical style. Think billowing curtains, bohemian dhurries and ornate fabrics. Home-style North and South Indian dishes are served. Admirable green policies it is the ideal break for the eco-warrior. 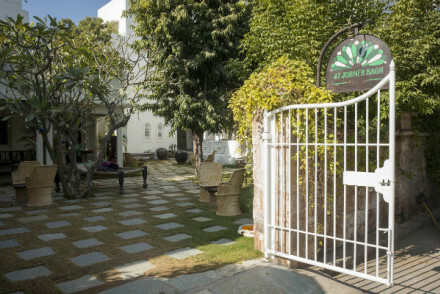 Set within seven acres of land amidst the Aravalli hills and just a 30 minute drive from Jaipur, Tree of Life provides daily yoga and meditation classes and a revitalising spa. The prefect way to explore from afar. Rooms are comfortable with private terraces and food is mainly organic. A haven. Sights nearby - Make a day trip into town to visit the Amber Fort and other sights. Great walks - Explore the local villages and farms. This luxurious Maharaja's Palace has beed exquisitely restored with the finest Italian marbles, Egyptian cottons, mahoganies, and Swarovski chandeliers. The 38 suites are divine, as are the equally majestic verandahs, gardens, and food in the wonderful restaurant. Sights nearby - The Amber Fort is Jaipur's main attraction. Go at sunset for the best views. Local markets - Bapu Bazaar is Jaipur's busiest and most popular market. A traditional Rajput palace just outside Jaipur. Wonderfully romantic rooms and suites, all individually decorated, but each as magical as the next. 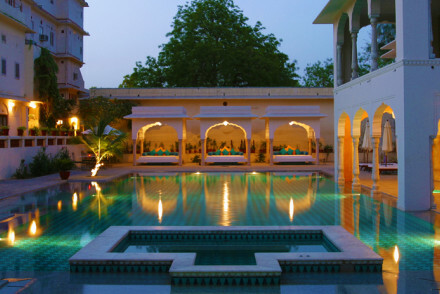 Terraces, pools, tennis courts, camel safaris, fantastic Rajasthani and European food. Regal and luxurious. 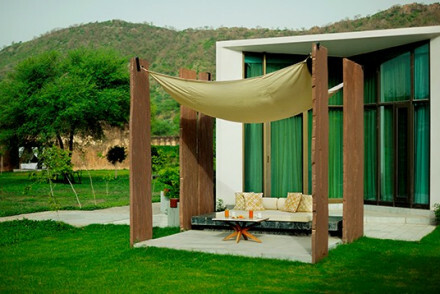 Total relaxation - Located outside of town, in rural Jaipur with a luxurious spa. There are plenty of ways to unwind. Romantic Break - Candlelit dinners, sumptuous rooms and a divine spa. Local markets - Jaipur's famous textile market is great for fabrics and rugs. A fabulous 230 year old hilltop fort turned luxury hotel, in the Aravalli Hills. Indulgent suites have been beautifully restored to maintain the historic charm and real life palace feel. Get the royal treatment with a range of restaurants, a pool, organic kitchen gardens, and an impressive spa. 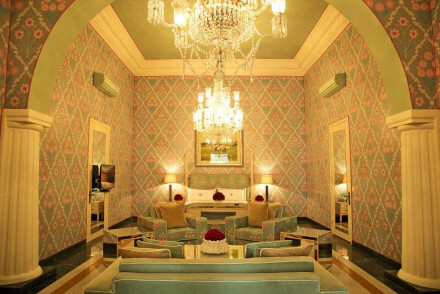 Royal treatment in the home of the former Maharaja of Jaipur. The interior decoration and surrounding grounds echo the magic of a bygone era - marble floors, beautiful colonnades, and acres of luscious gardens. A fabulous place to stay. Sights nearby - The Amber Fort, Hawa Mahal and Jantar Mantar are all must sees. Local markets - Bapu Bazaar is awash with sparkling sarees and jewellery. A truly unique property: "Glamping with Elephants"! 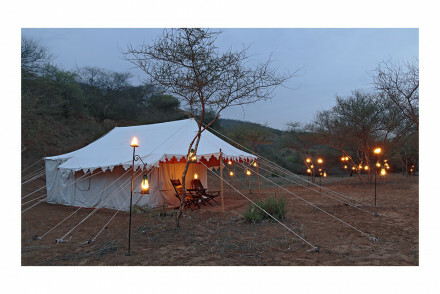 Located a 30-minute drive from Jaipur this private desert camp features classic, colonial style tents and furnishings. Dine under the stars, by the campfire at night. Operational from October - April. Great for couples and families. Sights nearby - Jaipur and its many sights: City Palace, Amber Fort to name a few. A rose tinted palace in The Pink City. Eight desirable rooms have stylish interiors courtesy of the acclaimed Adil Ahmed. Rooms are decorated in chic palettes of contrasting colours: turquoises with pinks, blue with white (so photogenic). Dining is an equal parts aesthetic and tasty affair. Sights nearby - Enjoy a private tou or the City Palace. A five star palace just outside Jaipur. Luxury rooms, suites, tents, and villas decorated with the utmost style - romantic, sophisticated, antique. Four poster beds, private pools, butler services. Fantastic food, state of the art spa, attentive staff. An utteraly spoiling experience. Romantic Break - Sumptuous rooms, grounds and interiors plus private candlelit dining and spa treatments. 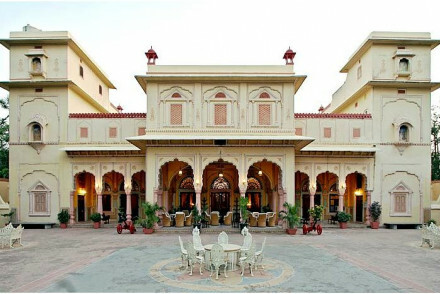 City Style - Without a doubt, one of the most luxurious hotels in Jaipur. Sights nearby - Hawa Mahal, Jantar Mantar, The Monkey Temple, CIty Palace and not to forget the Amber Fort.